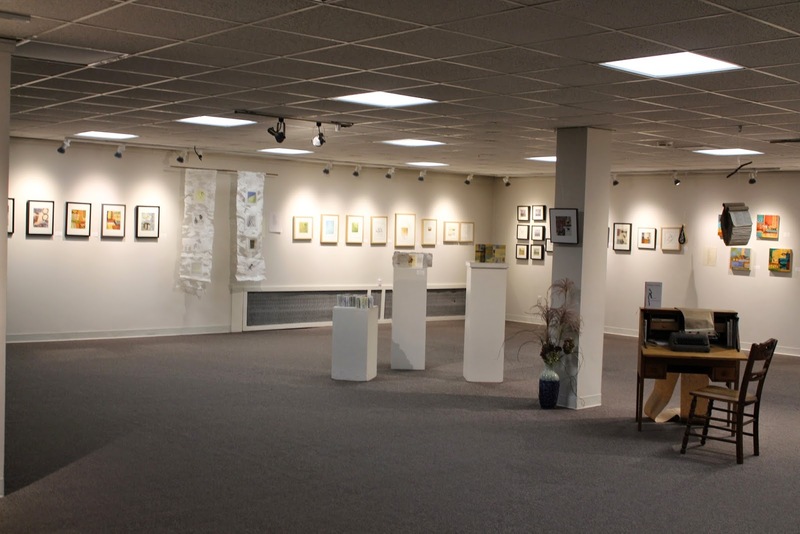 Michele, Susan and I, assisted by our most amazing helpers Colleen, Betsy and Jack, have hung our show Call and Response - a multi-media exhibit at ArtSpace Gallery in Maynard. 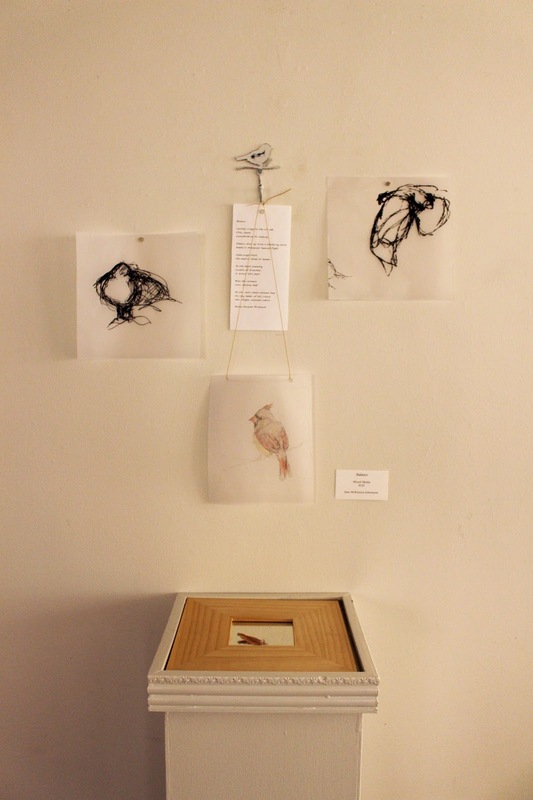 We have combined poems, drawings, collages, prints, paintings, artist books, sound recordings, lights, nests - both real and imagined - along with a writing desk with beckoning typewriter for your creative participation. 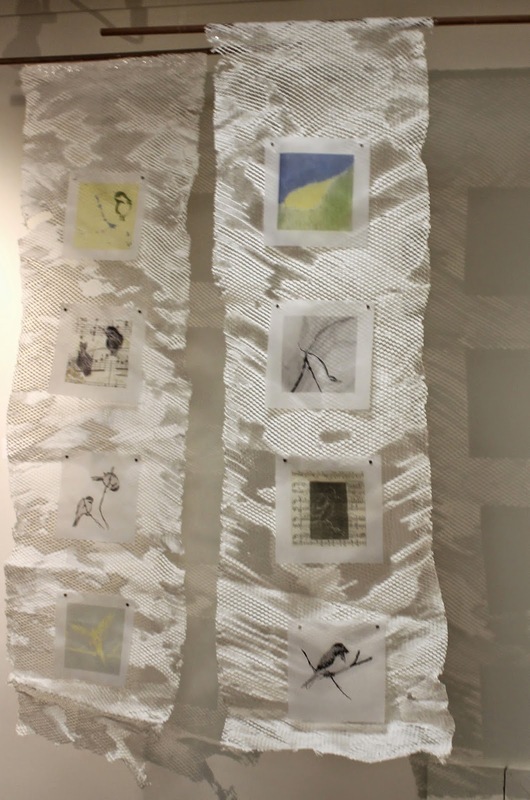 The idea for the show was conceived when Michele and I peeked around the partition in our studio and realized that we were simultaneously working on images emanating from a common muse, birds. 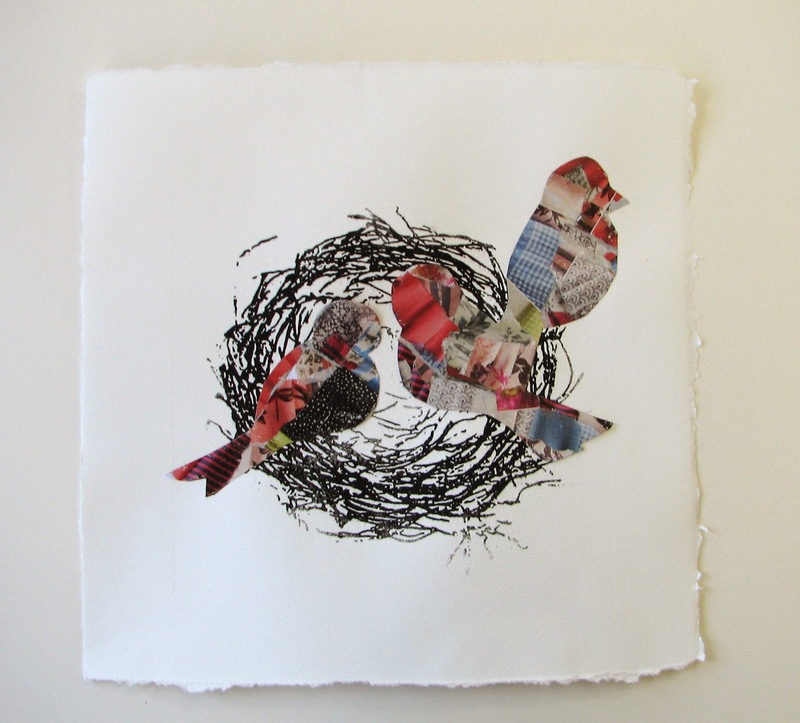 I was in the midst of a series of works called Emptying Nests and Michele was working on a series with collaged birds and painting on board. We had both studied literature in college and Emily Dickinson's poem Hope is the Thing with Feathers came to mind and we envisioned a show combining poetry and visual art. When we met Susan Richmond, reading from her book of poems called Birding in Winter, the show was hatched. We wrote a proposal to the ArtSpace Gallery and we were excited when they gave us the month of April for our exhibit. It gives us the opportunity to celebrate Poetry Month and the return of spring. Meeting monthly for a year, we delighted in letting ideas and inspirations take flight and finalized some of these inspirations into a show we called Call and Response. Existing works were selected, new works created, and the collaboration of both literal and inspired calls and responses between the artists and their works began. 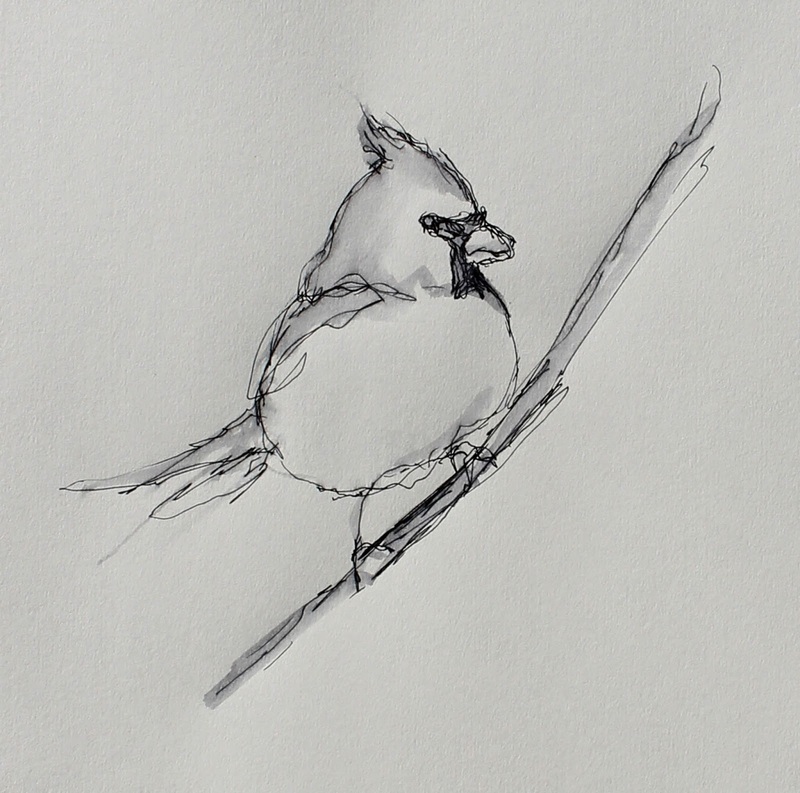 Inspired by Michele's works, I started to draw and include birds into my work. I experimented with collage and bookmaking. I thought of the bird as form as well as being. I played with brighter colors and more lyrical forms. I cut the form of birds out of brightly colored collage and combined it with one of my black and white pronto print creating the piece Spring Catalog Birds. 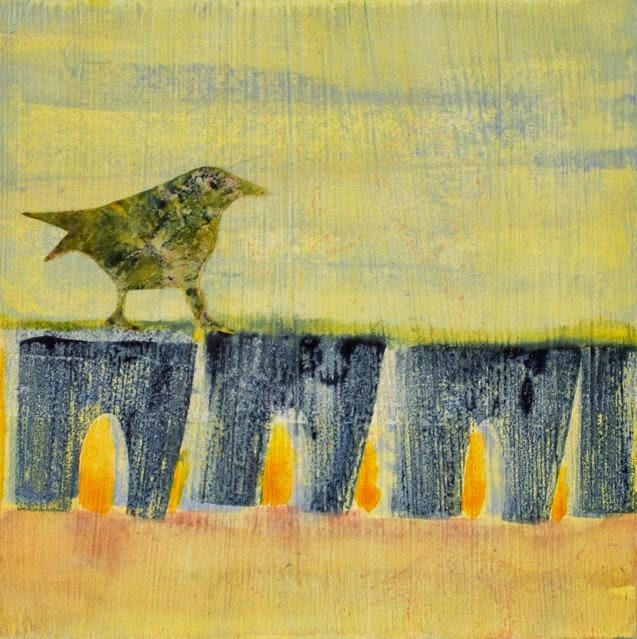 I longed to learn from the complexity and richness of her work and the "twinkle in the eyes" of her birds. I played with layering and altering the drawn images to see the lyricism of their shape not just their species. 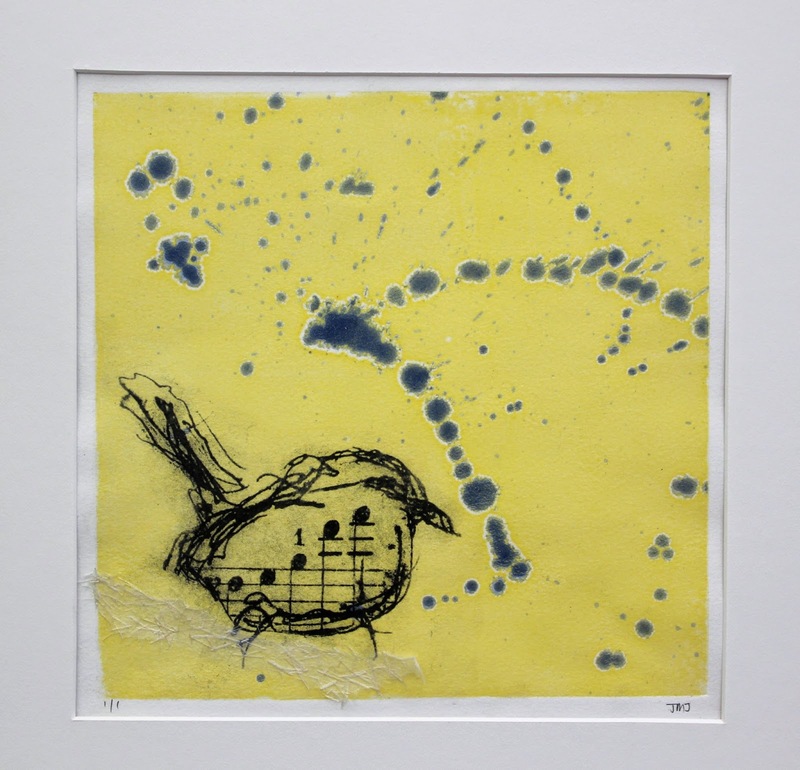 In Spring Song Bird, I used an unfinished monotype and overlaid it with a composite image on transparent vellum. The image was a digitally altered drawing on top of a scan of another print. I applied the inspiration of collage by using mixed media layers of my own works. I have only begun to explore the many avenues that have been called forth from responding to her marvelous work. Inspired by Susan, I created interpretations of her words in the pieces Balance and Nest. I wanted to go beyond illustrating the poems to try and create a sense of the work. In Balance, I used visual elements of placement, transparency, color, movement and stasis. 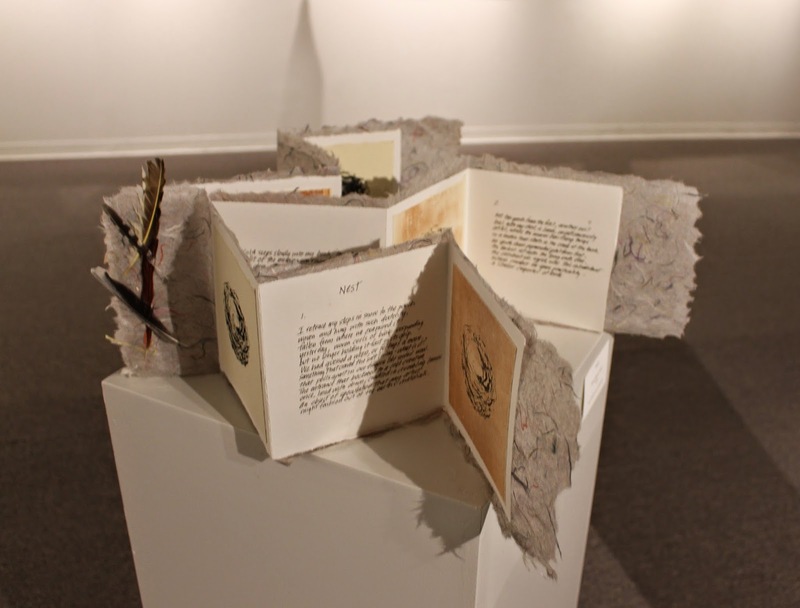 With Nest I recreated the sense of plein air discovery and investigation using multiple but slightly varied imprints of the same nest, spaced around corners and nestled in soft paper made from gathered materials. 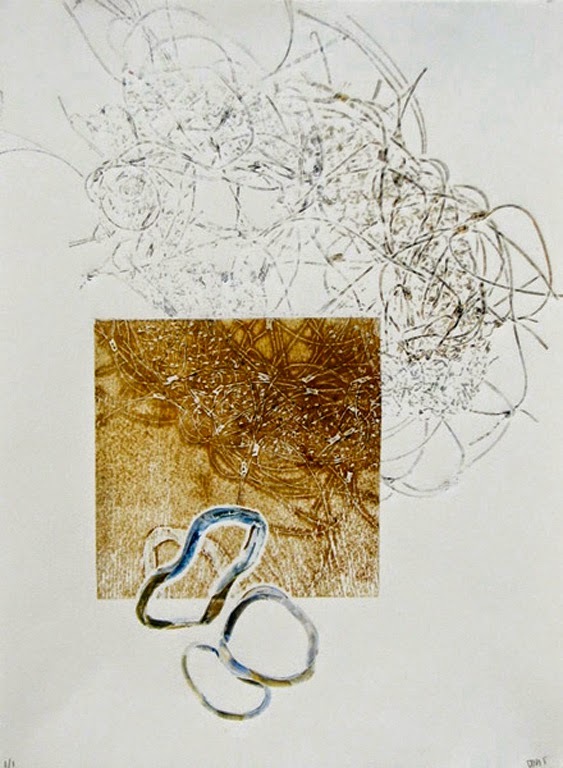 I moved from two-dimensional works to three-dimensional works and became mindful of installation and mixed media. Her magnificently evocative poems resonated with my experiences observing and creating in response to nature. Further challenged by combining poetry and image, I started to look at the pieces I was creating as parts of a poem, set within the context of the works around it, enriched by rhythm and metaphor. In the work Dawn Chorus, the work as poem is explored in the rhythmic repetition of image size, the variation of the images of altered birds, the integration of musical metaphor and the presentation of two panels recalling a poem of two stanzas. Vellum panels mounted like door sidelights with curtains of light vibrating off cut paper surfaces invite the viewer into a multifaceted view of an audible experience. Poems also appeal to me as marks on paper. I wanted to respond to the calligraphic nature of the written poem with line-work. I drew in graphite, pen and charcoal and wanted to transfer those calligraphic works to prints. Due to health challenges I couldn't use traditional etching or drypoint to capture the lines. I experimented with ways to transfer line that were less labor intensive than drypoint and etching and did some pronto plate and paper lithography. I also investigated digital printmaking and altering images in photoshop. In some instances, I realized that the drawings were the final product that I was looking for, but I had been so used to thinking of myself as a printmaker, I had limited myself from sharing these with others. In honor of that first collaborative moment, when Michele and I envisioned connecting visual art and poetry, I knew I had to work with Emily's poem, Hope is the Thing with Feathers. 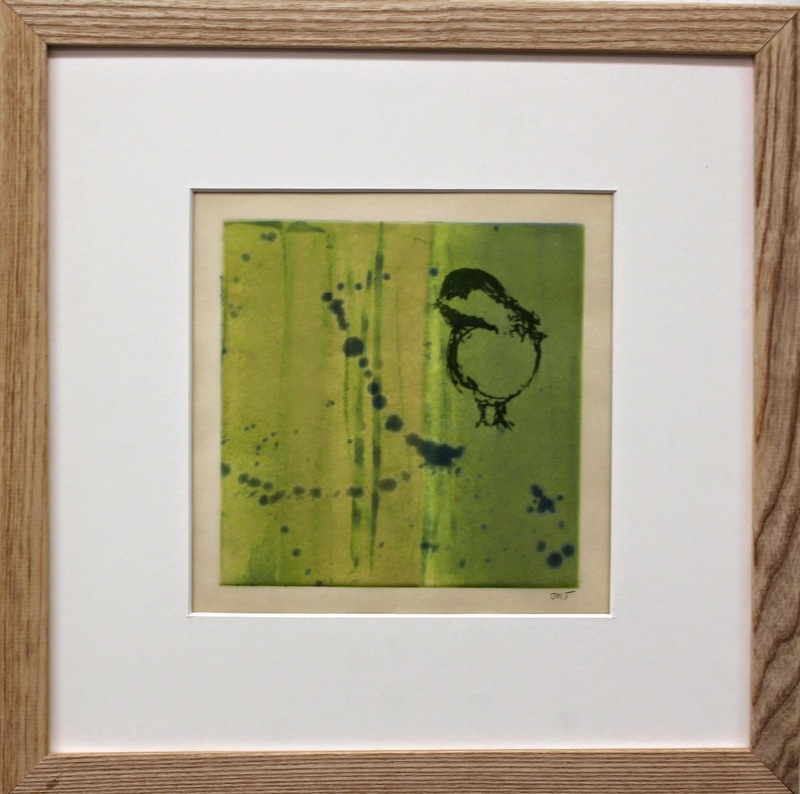 I used monotype and a paper lithograph of a digitally altered bird drawing. The buoyant yellow color, the paint splatters inspired by Michele's papermaking combined with the visual metaphor of music and the new terrain of digital imagery is a piece I would not have made without the inspiration of this collaborative experience. The gift of the collaboration, of listening carefully to the calls of these two talented artists has expanded my own art in both topic and technique.